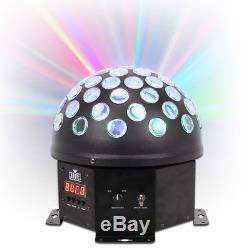 Chauvet DJ Hemisphere 5.1 LED DMX Multi-Colored Disco Light Effect Mirror Ball. Built with your needs in mind, this package is brought to you by Electromarket. 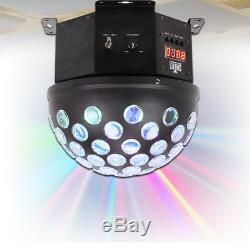 Package Includes 1x Chauvet HEMISPHERE5.1 DMX LED Disco Ball Light. FFA0114 - Chauvet DJ Hemisphere5.1 Rotating LED Disco Light. From DJ lighting pioneers Chauvet comes the Hemisphere 5.1: a room-plastering centrepiece that projects multi-coloured LED beams through dozens of clear lenses: just like a rotating mirror ball without the mirrors! Individually controllable LEDs match the mood of any event or party and allow you to create custom lighting shows. Multiple control options include 5-channel DMX mode and built-in automated and sound-active proframs. Power link up to 10 units to save time running cables, and no duty cycle means the fixture can run all night without giving up on you or your audience. Dazzling, multi-colored centerpiece effect similar to a mirror ball. Contains red, green, blue, white and amber LEDs for maximum color options. Convenient center mounting point allows you to hang the unit with a single clamp. User-selectable colors in stand-alone allow customized looks without a DMX controller. Motor spins in both directions and at variable speeds to create an ever-changing star field. Power linking saves time running cables and extension cords. Awesome sound-activated programs dance to the beat of the music. Built-in automated programs via master/slave or DMX. Light source: 5 (1 red, 1 green, 1 blue, 1 white, 1 amber) 3 W (730 mA) LEDs 50,000 hrs. Strobe rate: 0 - 13 Hz. Input voltage: Auto-ranging 100-240 VAC 50/60 Hz. Weight: 6.4 lbs (2.9 kg). Size: 10.7 x 10.7 x 10 in (272 x 272 x 254 mm). A tracked service is available when you select a 48 hour or 24 hour courier service. Due to our carriers charging extra for Highland and Islands, we need to pass this charge onto our customers. Where do you deliver to? We deliver to the UK, Ireland and internationally covering most of the EU, including. All deliveries will require a signature so please ensure someone is present to sign for the item. The couriers will try and deliver the item twice before returning the item to us. Please note: we do not cover faults caused by accidental damage, neglect, misuse, modification, liquid ingress or normal wear and tear. We also request that you return the goods to us in its original packaging where possible. Our welcoming Sales Team are experts in all aspects of the entertainment industry. We will listen and discuss your ideas, doing our best to help and advise you with what product would be ideally suited for your requirements. If there are any additional costs you will only be charged the difference between the original order and the new order. This is so that we can offer you the highest quality Customer Service and we are able to track your return when it is received into our warehouse. How do I find the item number or product code? The product code of the item is displayed in orange text to the right hand side of the main image in the description. It will be displayed as a seven-figure code e. Can I amend my order? Before dispatch: you can amend your order, or cancel your order at any time. Sorry - we do not accept reservations on items. How can I return my item? It is the responsibility of the customer to return the item. We may have already answered popular enquiries and questions on our FAQ page. If you have any enquiries, concerns or questions about your order, our policies or any of our products: our friendly customer service and sales team are on hand to assist you with anything you may require. We are open 6 days a week, excluding bank or public holidays & annual holidays. The item "Chauvet DJ Hemisphere 5.1 LED DMX Multi-Colored Disco Light Effect Mirror Ball" is in sale since Friday, October 6, 2017. This item is in the category "Sound & Vision\Performance & DJ Equipment\Stage Lighting & Effects\DJ Lighting Single Units".